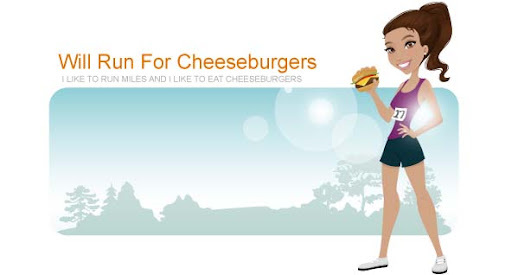 Will Run for Cheeseburgers: Only 5 left! The countdown is ON to my half marathon on the 3rd. Only 5 more training runs to go! Just took it easy with my 3 miler today. Jogged a slow 2 miles on the treadmill and did the 3rd mile along the indoor track at a faster pace. After running 5 miles around the indoor track yesterday, my right foot/ankle hasn't been feeling great. Since I can't afford an injury this close to race day I'm going to take it easy during the last few runs. Well, except for the 10k on Saturday. It's a race and no matter how many times I tell myself I won't push it, I just can't help myself. Tomorrow's 3 miler will be slow due in part to pushing Anderson in the jogging stroller. Hoping the rain stays away long enough for me to get my run done after Mason's preschool drop off. Otherwise it's going to be another indoor track day for me!